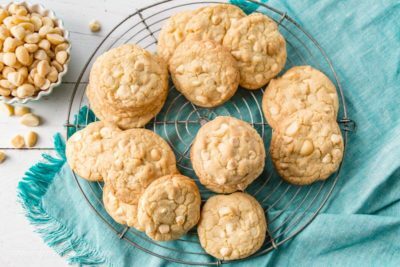 White Chocolate Macadamia Nut Cookies with Coconut – this cookie is a shining star of the dessert tray! Delicious jumbo-sized thick and chewy cookies that rival any from the gourmet bake shop. 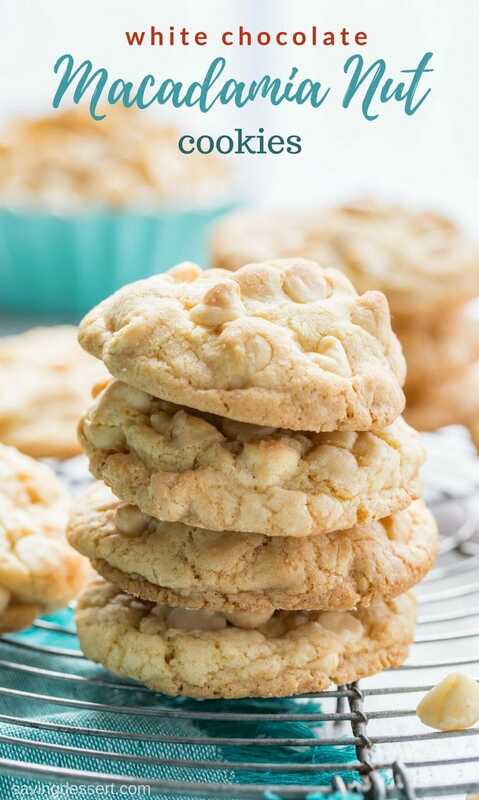 If you love white chocolate and macadamia nuts, this is the recipe you’ve been dreaming about. With just a touch of shredded coconut and coconut extract, the flavor is elevated to a tropical treasure! Even if you don’t love coconut, I think you’ll enjoy this cookie because the coconut flavor is subtle but with a big impact. Crispy on the outside and chewy on the inside, and stuffed with nuts and chocolate chips, these cookies are incredibly satisfying. Our Coconut Rum Blondies are also loaded with white chocolate chips and toasted macadamia nuts and simple enough to be ready in no time. Minimal effort – delicious results! Chocolate is always at the top of my list of favorite dessert flavors, however white chocolate doesn’t always come to mind. If you’re like me and find white chocolate chips to be a little on the sweet side, be sure to reduce the amount of chips added to this recipe. I’ve noted a range of 1 to 2 cups of white chocolate chips in the recipe, so you can can decide what you like best. Somewhere in between, around 1 1/2 cups is the perfect amount for me. But don’t skimp on the macadamia nuts however, so good! We use unsweetened, finely shredded coconut in this cookie recipe. If you can’t find unsweetened coconut in the baking aisle of your grocery store, check the organic section. We keep a container of coconut in the refrigerator to add to our oatmeal and cereal in the mornings. Unsweetened coconut can add a lot of flavor without overpowering your breakfast or desserts. TIP: To keep these cookies nice and chewy, add a slice of bread to the storage container. A slice of soft bread will help keep the cookies from becoming tough and dry if you have them around for a few days. This old trick also works for brown sugar. The bread becomes hard and dry, and the sugar or cookies soften. So don’t throw out that old dried up brown sugar! You can fix it easily with a little soft bread. Delicious jumbo-sized thick and chewy cookies that rival any from the gourmet bake shop! Adjust your oven rack to the lower middle position and preheat the oven to 325 degrees. Line 2 baking sheets with parchment paper. Set aside. In a medium mixing bowl combine the flour, baking soda, salt and coconut. Set aside. In the bowl of a stand mixer fitted with the paddle attachment, beat the melted butter, brown sugar and granulated sugar on medium until smooth and lightened. Add the egg, egg yolk, coconut extract and vanilla. Blend on medium speed until combined. Reduce the speed to low and add the flour mixture in 3 additions, blending just until the flour disappears. Scrape down the sides and bottom of the mixing bowl with a rubber spatula, and mix again and well combined. Add the nuts and chocolate chips and stir with a stiff spatula or wooden spoon until combined. Using an ice cream scoop that holds about 2 tablespoons, roll the dough into balls and place them 2-inches apart on the prepared cookie sheet. Bake the first sheet while rolling the remaining cookie dough. Bake for 17-20 minutes or until the edges are set and beginning to brown and the center are still soft and puffy. Rotate the sheet halfway through baking to ensure even browning. Remove from the oven and let the cookies cool for 10 minutes before transferring to a wire rack. Or, if you are using a rimless baking sheet, slide the entire sheet of parchment and cookies onto the wire rack to cool. Store in an airtight container at room temperature with a slice of sandwich bread to keep the cookies soft and chewy if storing for more than 1 day. Makes 24-28 cookies, depending on the amount of chips used in the cookie dough. Love white chocolate? You might want to try our Cinnamon Granola Bars with White Chocolate Drizzle. They’re a great addition to any lunch box or terrific for an after-school snack. How about this super simple Oreo White Chocolate Fudge from That Skinny Chick Can Bake – it looks wonderful! 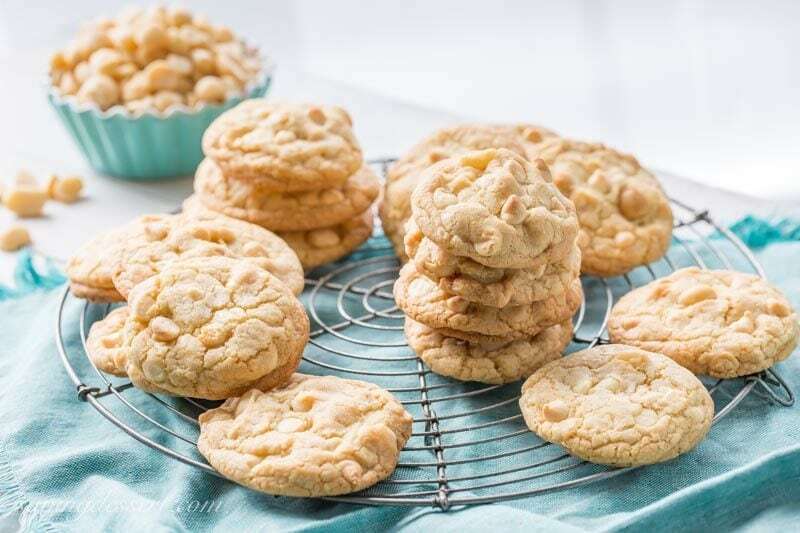 Love this twist on the classic cookie – White Chocolate Snickerdoodles from Two Peas & Their Pod. and finally, how about this White Chocolate Macadamia Pie from Taste and Tell? So pretty! The combination of textures in these cookies sounds divine! Many Soldiers Angels bakers swear by the bread trick for care packages that travel for weeks. It works! The secret is making sure the container is as airtight as possible, so that the bread can do it’s magic without molding. We always had bread in our cookies, it was a favorite trick I learned from my mom. I bet it really works for those long distance treats! Thanks Wendy! How delicious, Tricia! These must have the best mix of textures. I don’t know why I never bake with macadamia nuts…they are so good and really special in a cookie like this. And it just seems to work so well with white chocolate. You got me daydreaming of Hawaii and…these cookies! Definitely pinning this to my cookie board. Can’t wait to try them! These are gorgeous Tricia! Thanks Abbe – you’re in for a treat! Thanks Susan – we really love these cookies and the touch of coconut! Those cookies are gorgeous! 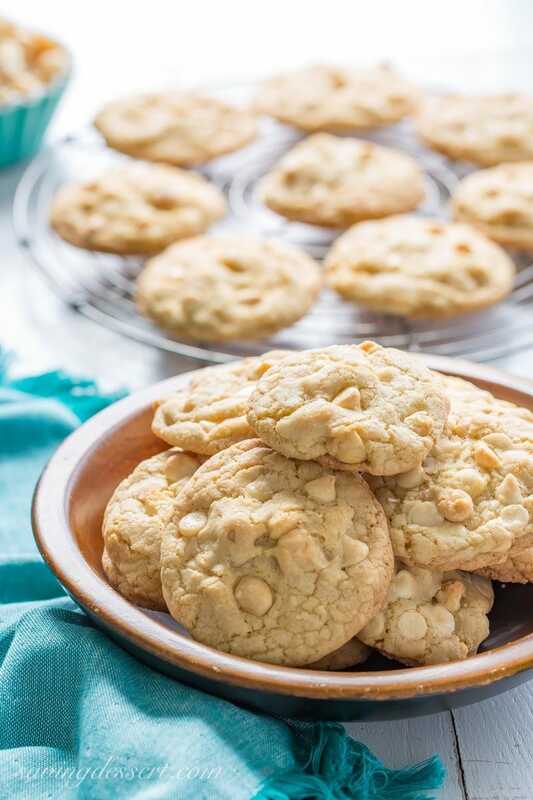 I love white chocolate macadamia nut cookies and the addition of coconut is a no-brainer! The coconut really makes these cookies something special for sure. Thanks so much! Macadamian nuts and white chocolate, I wish I had one of your cookies right now. They look so good. These are worth the splurge Gerlinde – thank you! You are an energizer bunny Tricia..so many new and delish recipes.Thank you! Oh, my! Everything I love in one beautiful cookie! What a wonderful combination of flavors! These really are terrific cookies Chris – thank you! I can’t imagine life without nuts, our family is full of nuts – haha. Hope you get the chance to make these cookies Liz. Thanks! The coconut really makes these cookies Jennifer. Thank you – hope you love them too! 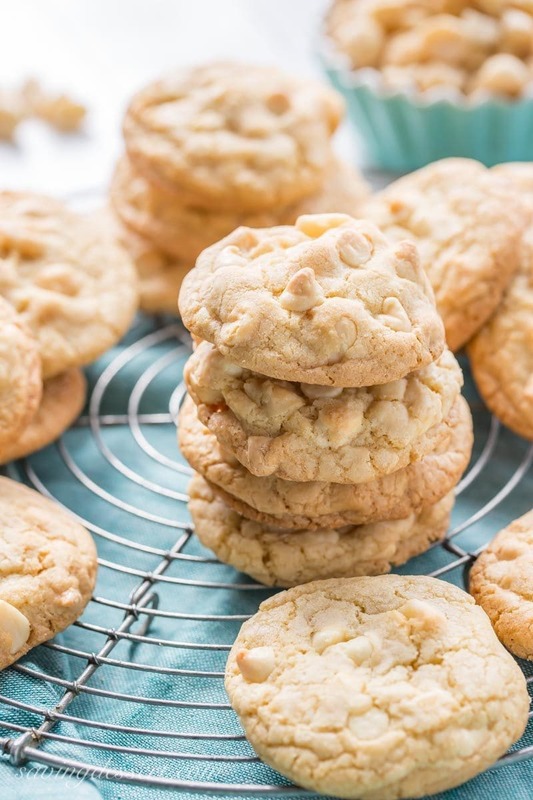 Macadamia, coconut and white chocolate…these cookies would be a huge hit in our house! They flew out of here in a flash. I love the variety of textures and the chewiness of the cookie – so satisfying 🙂 Thanks Angie!